One. MONO by Erin Emocling. When Erin posted on Facebook that she published a photo zine of a her black and white photos in 35mm, I eagerly signed up for a copy. She has some very interesting shots which you can check out in MONO's Facebook page. You can also go to her website for more of her black and white photography. Two. My G-Shock watch with a paracord strap from GalingkayEloi. I've known about paracords (parachute cord) from Muffet as she was looking for sturdy and durable keyrings and she found galingkayeloi's Instagram account. Paracord is also referred to as the survival bracelet. Read about it here! Three. 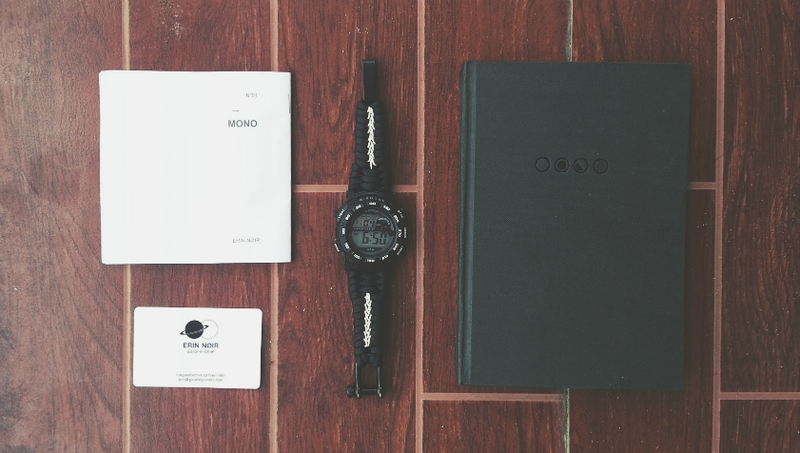 Moonleaf's 2015 planner. Finally! Been scouting the Makati area for this planner for the past weeks. And I know it's already February but still, it's not too late to have an organizer. Planners help me organize my thoughts, so mental notes are not forgotten. It's simple, sleek and spacious. Even comes with stickers and milk tea discount coupons. All for the price of PhP 350. You definitely get the bang for your buck! I particularly love th watch! G Shock represent!